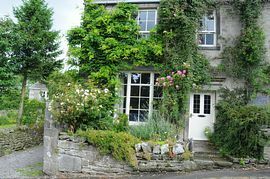 Hill Top Cottage is a Grade II listed, early 19th century, traditional stone cottage in one of the Yorkshire Dales' loveliest villages. 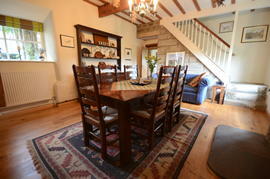 Appletreewick makes the perfect base for a Dales holiday. Located within the Yorkshire Dales National Park, yet only eight miles from Skipton, it is surrounded by beautiful scenery, and is a great starting point for walks. The clever room plan means that Hill Top can sleep six people in three cosy bedrooms. The third bedroom has bunk-beds and is ideal for children. 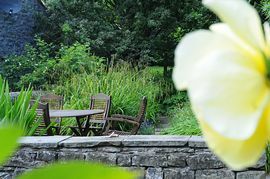 The large garden is completely enclosed and is a wonderful place to spend a lazy, sunny afternoon. 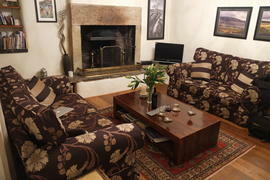 The living room has two large sofas and an open fire with a 18th century dog grate. TV, satellite receiver and DVD/video player are available. The dining room has a large table that comfortably seats 6. The kitchen is fully equipped, with fridge/freezer, over and ceramic hob, microwave, dishwasher, toaster, high quality pots and pans. The bathroom has a bath with shower over bath, wash-basin and toilet. There is an additional downstairs toilet. On street parking in a quiet road. Listed stone cottage with large, completely enclosed garden. Great village - two pubs and fantastic walks. 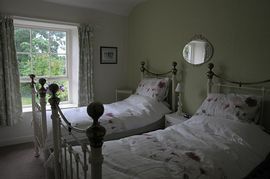 Non-allergy duvets provided with bedlinen and towels. One well-behaved dog welcome, but please keep him/her off the beds and sofas. Large enclosed garden - perfectly safe for children and dogs to run around. Terrace with garden furniture. Small barbecue. Outhouse with storage for bikes and outdoor equipment. On the main road in the centre of Appletreewick village. All prices in pounds sterling for one week, including heating, electricity, bed linen and towels. Weekly rentals are available all year round, Saturday to Saturday.